Barbara ~ these were so good and so easy! Thank you for posting this recipe. I’ve tried 2 other recipes both added either cottage cheese or cream cheese. Although I like cottage cheese and cream cheese – blending as instructed just didn’t give the texture I was looking for. I have not ever had a Starbuck’s egg bite so I had nothing to compare to. Your recipe is perfect! I only had 1 egg bite mold so used that and a layer of silicone muffin cups with a rack in between ~ fabulous!! I cooked these in my Foodi. Thanks again. Thanks DJ! Sounds like a smart way to stack them. 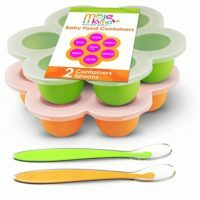 Hi Cheryl – I’ve used these 6 ounce Pyrex cups successfully many times https://amzn.to/2U9vXtM, be sure and use them with a rack. 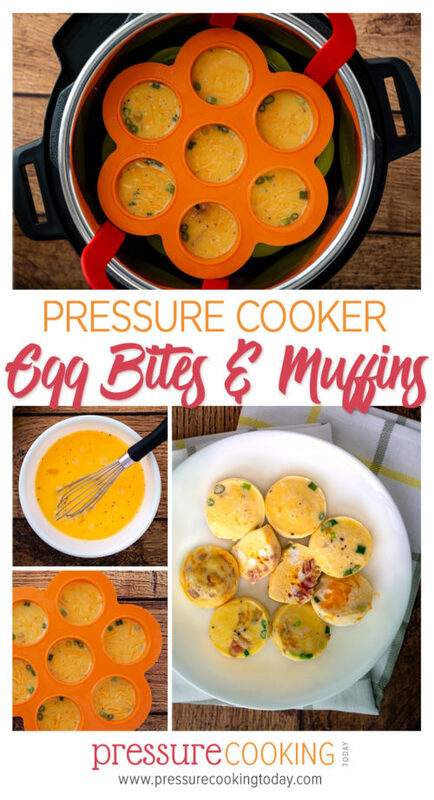 Your time will vary depending on how much egg mixture and what mix in you use in each cup, but I would try the 8 minute cook time. I would like to make this recipe in order have on had to give to a friend who has children, so I would like freeze them. Can you tell me if they freeze well? Hi Laural – they do freeze well. Hi Gale – the video will be in different places depending on whether you’re watching it on a desktop computer or mobile. On desktop it is right above the paragraph that starts What I love about… You may have to click the play arrow if it doesn’t automatically play for you. If you’re using your mobile phone it will be right underneath the paragraph Update: To show you easy … paragraph. It may just take a little longer to load the video than it does for pictures. Thanks for your patience! This is a recipe I forgot ALL about! I have everything for them too. 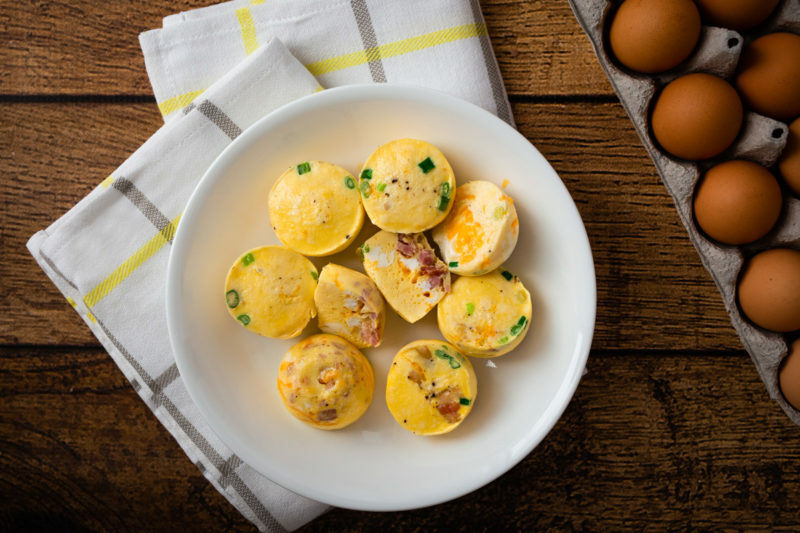 I made a Mexican themed one when I tried them and they were delicious…perfect for a quick breakfast. I’ll have to dig out my egg molds and make some more. The last time I did them on a rack….I think I’ll use my silicone sling this time like you did. I don’t know what I did without that thing! 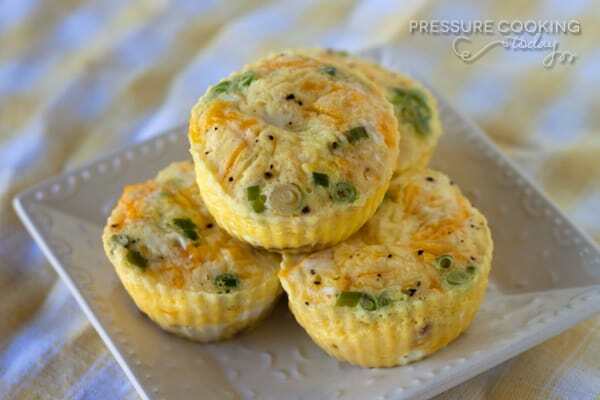 I tried this recipe using stackable pans as I wanted to make 12 muffins. When I opened the pressure cooker after the appropriate time, they weren’t even cooked! 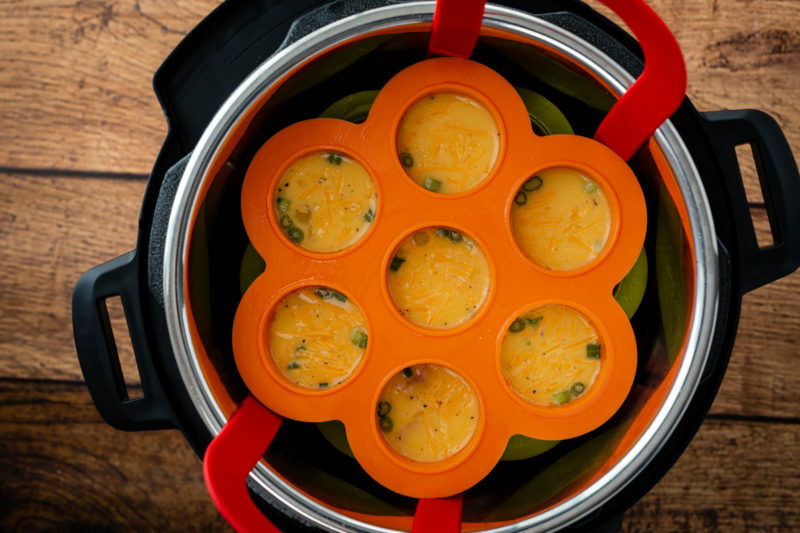 Would using stackable pans make a difference in the recipe? Or doing 12 instead of 4 or 5? I used the same recipe last week only cooking 4 on a trivet and they out perfect. I’m confused as to what went wrong. Thanks for any help! Hi Amy – yes, using stackable pans changes the timing. Any time something is enclosed in a pan it slows down the cooking. Even covering with tin foil when making a cheesecake you need to add 5 minutes to the cook time. This was FABULOUS. I am a Vegetarian so I subbed the bacon with the Morningstar Farms Veggie Bacon. I also added a little heavy cream to the egg mix. I just made these this morning and they are delicious! I did not have silicone baking cups, but used glass custard cups. I wonder though if I should decrease the time with glass. Can’t wait to try again maybe adding a little milk or cream plus veggies! Thanks so much for posting such yummy and easy recipes! Thanks Sharon! Glad you enjoyed them. Definitely try reducing the cook time if you feel it’s necessary. I cook them just nestled next to each other on a trivet. up to 18 no problem. I’ve had the 6qt Instant Pot for a year now and was lucky enough to get the 3 qt for Christmas this year. I’ve been cooking eggs and just love using the pressure cooker for that but have recently “discovered” the steam feature makes incredibly light and fluffy eggs. I use two eggs, two tablespoons of heavy cream, one tablespoon of butter and some cheese (sorry, I don’t measure the cheese). I zip all ingredients in a ninja/bullet type cup blender and then pore into a large silicone muffin cup and loosely cover with foil. I use 1 cup of water and the steamer trivet. I close the lid and vent and put it on the steam feature for 8 minutes and let it naturally come down in pressure for 10 minutes. The eggs are perfectly cooked and so light and fluffy. This is my new favorite. 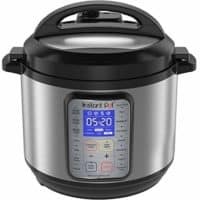 I absolutely love my instant pots. Thanks for sharing your tips Caren! I’m a little late to this thread, but I was really excited to see this recipe with fewer ingredients and instructions for a longer cook time. 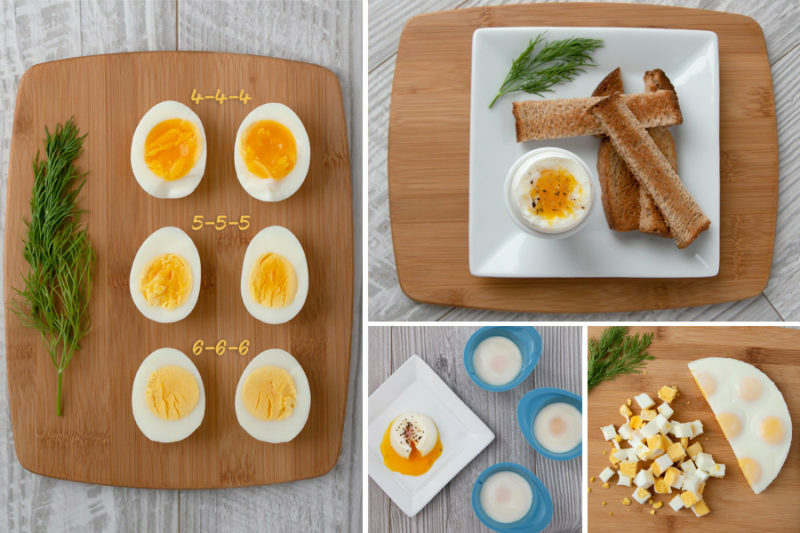 I’ve seen a number of egg bite recipes online that use the Steam setting and I was always disappointed that the bites came out so soft and fragile. I haven’t made this quite yet, but I’m going to give it a try using the High Pressure setting and the longer cook time. This is a wonderful recipe, light and soft, not dense like ones I have made in my oven. I am on WW so i used Canadian Bacon instead of the bacon. I will splurge on the weekend and use bacon next time. I did add 2 T. FF Half and Half and spinach. I covered mine with foil, made 7 using two tiers. Cooked them for 10 min. with 2 min. natural release then quick released after that. 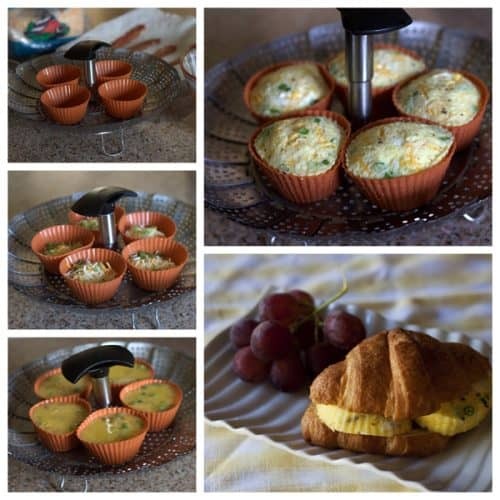 This was the first time using a silicone muffin cup and they worked great. Thank you! I food prep on Sunday afternoons for the coming work week and was so excited to see these as I have been baking them in the oven and promptly went to Amazon to purchase the silicone cupcake liners to use. I did my first batch yesterday morning and they would have been worthy of a Pinterest fail picture. lol They were all kinds of stuck in those silicone liners and I ended up with a big mess. After doing a little more reading, I learned I would probably need to spray the liners with nonstick spray, so I tried again and they turned out perfect. My next goal is to stack them so I can do 10 at one time. I used the same steamer basket as in your picture, so I assume I can cover the top of that with foil and stack the other 5 on top? I did change the recipe as I’m on WW – I filled the cups with fresh spinach, chopped tomatoes, diced ham, a little cheese and then poured Egg Beaters over all of that. I filled the cups with everything but the Egg Beaters, then placed them in the pot in the steamer basket and poured the Egg Beaters in each cup, so I didn’t have a problem spilling. I also cooked them at 10 minutes HP as 8 minutes seemed a tad undone. Anyway – I’m thrilled with the results – I package two together and wrap in plastic wrap to bring to work. Pop them in the microwave with a little salsa and it’s a really good breakfast, and the ones today seemed fluffier since they were cooked in the Instant Pot vs. the oven. Thanks a million for another great idea, Barb! So nice to hear you’re loving the idea. Such great tips! Thanks for sharing Brenda. Question: Do you have to cover them with foil or something while cooking, to keep from getting condensation in the cups? 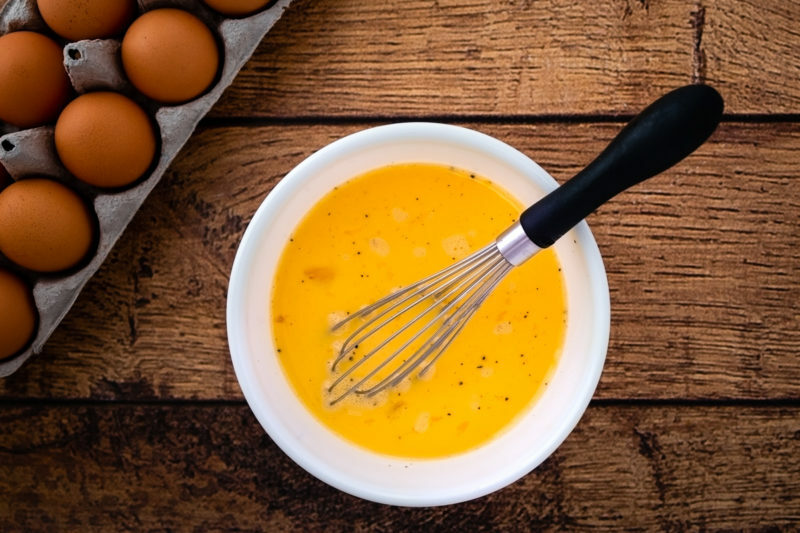 Hi Cindy – the little bit of condensation pretty much gets absorbed into the egg so you don’t need to cover it with foil. If you’re concerned you could cover it with foil but you’ll need to add extra time. Enjoy! I just made these but used 5 eggs with about a tablespoon of milk mixed in and added veggies; peppers, mushrooms and tomatoes. It ended up making 10 muffins. Hi Sara – yes, I’ve frozen them with good results. How many can you make in there at one time? Just curious, as I meal prep and make 10 for the week in the oven. 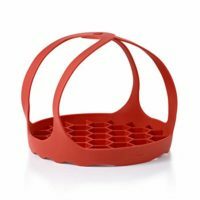 Is the steamer basket in the picture the one you used in your pressure cooker? I have the same one, but I wasn’t sure with the plastic part that it could go in. Thanks! Hi Erika – yes, the OXO steamer works great in the pressure cooker. It’s my favorite. I second that on the OXO steamer!